It’s such a sweet gesture to bring little gift for the nursing staff to show your appreciation. Who doesn’t want to be on the nursing staff’s good side when in the hospital? 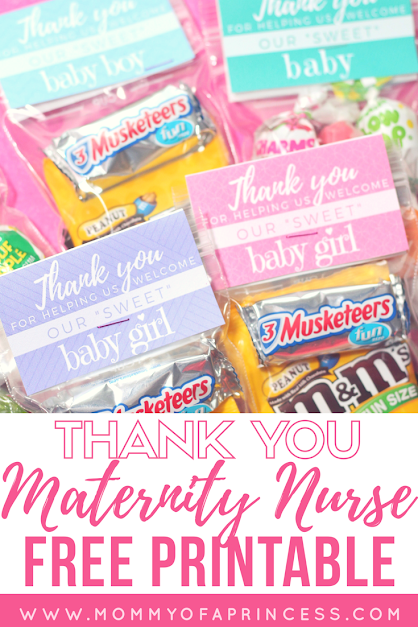 With my last pregnancy, we brought candy filled bags, because there was such a great response, I knew I definitely wanted to bring maternity nurse gifts again with baby #2. I purchased these snack size bags which are the perfect size! They’re only 3″ wide and the width of a business card (and the free printable label I’m sharing below). I filled each bag with candy, some chocolate and some fruity. Ultimately, you can include anything you want as long as it’s “sweet” so it matches the tagline of the printable. 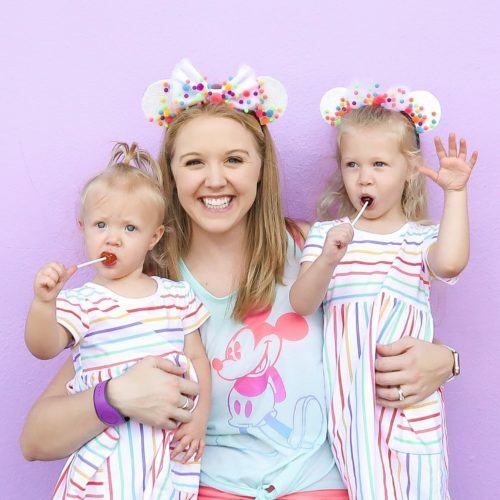 The labels are designed in multiple colors including pink and purple for girls, blue for boys and yellow and teal for gender neutral (or if you’re waiting to be surprised at the hospital). To assemble, simply fill your plastic bags. Next, print and cut the FREE printables (available below). Then, fold the paper long ways (like a hotdog) and cut down the middle. Lastly, fold the cut paper in half length wise again and trim off the white. You should have a fold over tent type card. The printable is designed to fold over and be stapled together over the top of the bag (as shown below). Simple right? On average, you will be tended to by 3 nurses per 12 hour shift and with an average 48 hour stay that adds up to 12 total baggies.